The Mississauga Official Plan is now in effect, with the exception of the policies subject to the remaining appeals. For the policies under appeal in Mississauga Official Plan, the relevant policies in Mississauga Plan (2003) will remain in effect. Reference Mississauga Official Plan first when looking for current land use and policy applicable to a property. Where there is an appeal to a policy section or specific policy, reference the Mississauga Plan (2003) for the equivalent policy in effect. Please consult with staff from the Planning and Building Department, Policy Planning Division for interpretation and guidance on the Mississauga Official Plan and the Mississauga Plan (2003). Note: Some of these PDF files are quite large and may take some time to download. THE OFFICIAL PLAN REFLECTS AMENDMENTS UP TO July 2013. These maps deal with topics applicable to the City as a whole, such as the identification of environmental areas. 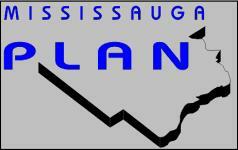 Mississauga Plan Appendix maps provide background information for interpretation and assistance to the implementation of Mississauga Plan policies, but are not part of Mississauga Plan. Graphically the maps indicate on a City-wide basis the location of Transportation Facilities, Jurisdiction of Conservation Authorities, South Peel Sanitary Sewer & Water Supply Facilities, Sub-Watershed Limits, Airport Obstacle Limitation Surfaces At Lester B. Pearson International Airport, Lester B. Pearson International Airport Operating Area, 1996 NEP/2000 NEF Composite Noise Contours, Oil and Gas Transmission Lines, Transit Terminals. To determine your land use designation in the Mississauga Plan, you will first need to determine your Planning District. Use the map below. Once you have determine your Planning District and have used the PDF map to find your specific land use designation, use the table above to access that specific Planning District and district specific policies. The Mississauga Plan also contains General Policies that apply to all Planning Districts. The district specific policies must be read in conjunction with the general policies. Note: This map is only to be referenced where there is an appealed policy in Mississauga Official Plan that relates to a Planning District in Mississauga Plan. To determine your property land use designation, click on the map link. This is a map of the City divided into individual Planning Districts. Once you have the city-wide map loaded, click on the appropriate District Plan map. This will display a PDF document that will allow you to determine your land use designation.